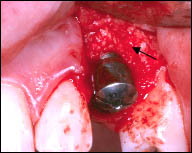 In order to place a dental implant there must be an adequate volume of bone into which the implant can be stabilized. 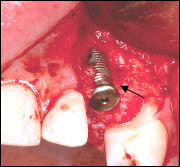 Deformities in the upper and lower jaws may limit the ability to place an implant. The deformities can be caused by periodontal disease, wearing dentures, developmental defects, injury or trauma. These deformities may limit the ability to place a dental implant. The deformities can create an indentation in the jaw, which can result in a poor esthetic result when the crown is connected to the implant. 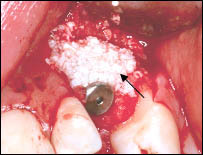 As a result, the area may be difficult to clean and maintain good plaque control. By placing a bone graft the lost bone can be regenerated by a process called Guided Bone Regeneration. The following case will demonstrate the correction of a bony defect associated with a dental implant. The graft material used is a biocompatible sterilized, deproteinized cow bone called Bio-Oss in conjunction with a collagen membrane from a pig (this type of collagen is used to repair heart valves). The combination of the graft and membrane allow for the regeneration of bone with minimal scar formation.